The February snows have arrived. I woke up last Sunday to the realization that a bit of snow had fallen and it was not going to stop. 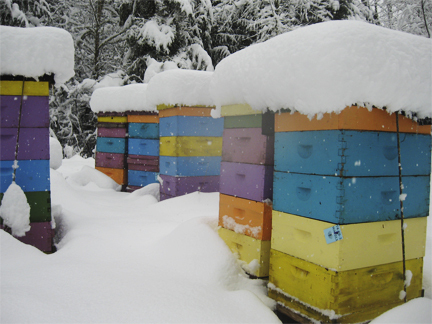 That slowed things down a bit this week, thus this photo essay of Brookfield Farm Hives in the snow. 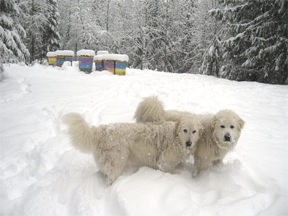 Our two livestock guard dogs came with me to check the hives. The larger one is the “puppy”, he is just one-year-old. It’s a winter wonderland – one I could do without. Snow should stay on the high mountains and not at the farm…if only nature could get that straight. 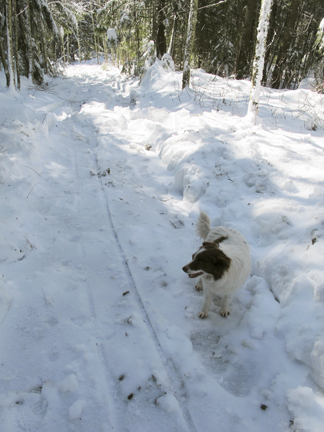 All was well, even with big chunks of snow falling all around us. The next day my husband, tiny dog, and I attempted to drive up the 3/4 mile to the farm. 1/4 mile in, the drive became and uphill walk. The farm is on a ridge – lovely, but challenging at times. It doesn’t really show, but that’s a fairly steep uphill section that’s preceded by the “bad corner” : a steeper corner where the road makes an “s” shape. The groove in the snow was from Ian using his childhood sled to bring down goods to the truck. First I went to get water for the packgoats. I had installed a rain chain to direct water to a collection bucket. It was a bit icy. 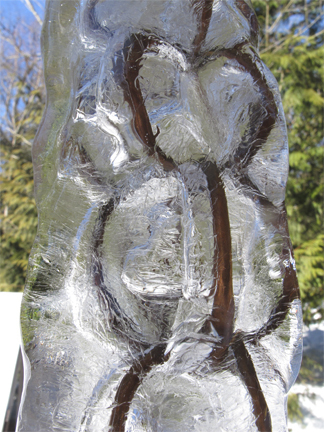 I could watch the melting water descend down the chain inside the ice. 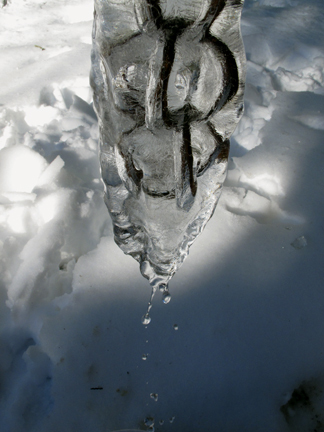 At the bottom the water dripped off the icicle and was filling buckets rapidly. So goats were fine for water. 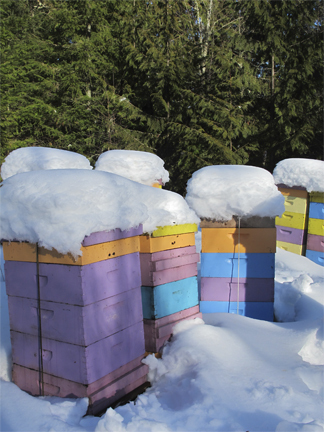 Then out to the hives. Fine, and beautiful. But, understandably, not a lot of bees flying. 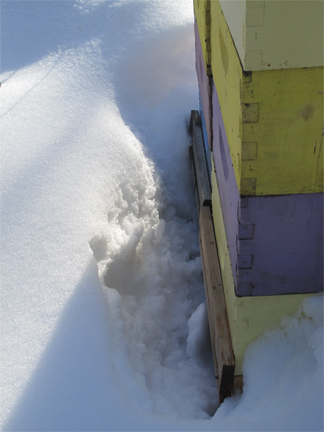 The bottom entrances were clear on some; I cleared others. But none of the bottom entrances were being used. 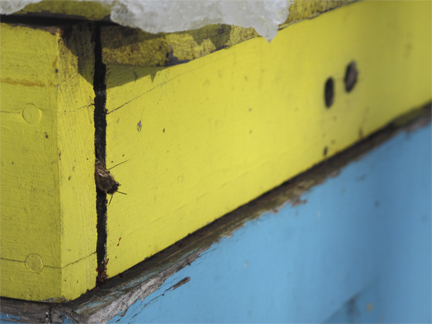 A few bees were using the top entrances to check out the sunny day. 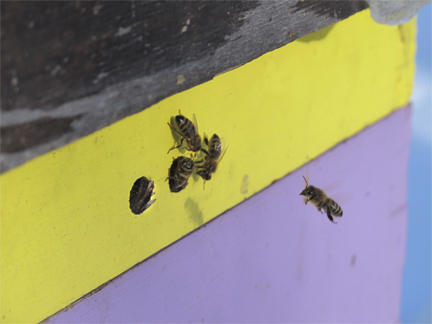 A few bees decided they liked an alternate top entrance, where the collars sides had slightly separated. …except for that 1/2 mile walk back down the ridge at the end of the day. Since then, my husband, Ian, has dug out the road. That’s the news from Brookfield Farm Bees And Honey, Maple Falls, Washington. We consider ourselves lucky. The world-wide weird weather has hurt so many people and animals. This snow storm has come and gone leaving only sore back. 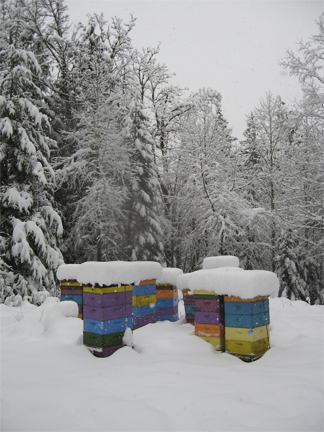 How are your bees in your parts of the world. I hope the weather is treating you well. 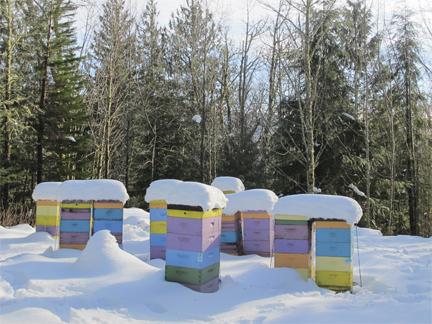 This entry was posted in Brookfield Farm Bee Yards, Farm and tagged beehives, bees, Brookfield Farm, livestock guard dogs, Maple Falls, snow, Washington, Winter. Bookmark the permalink.